This article previously ran on Jan. 11, 2017. 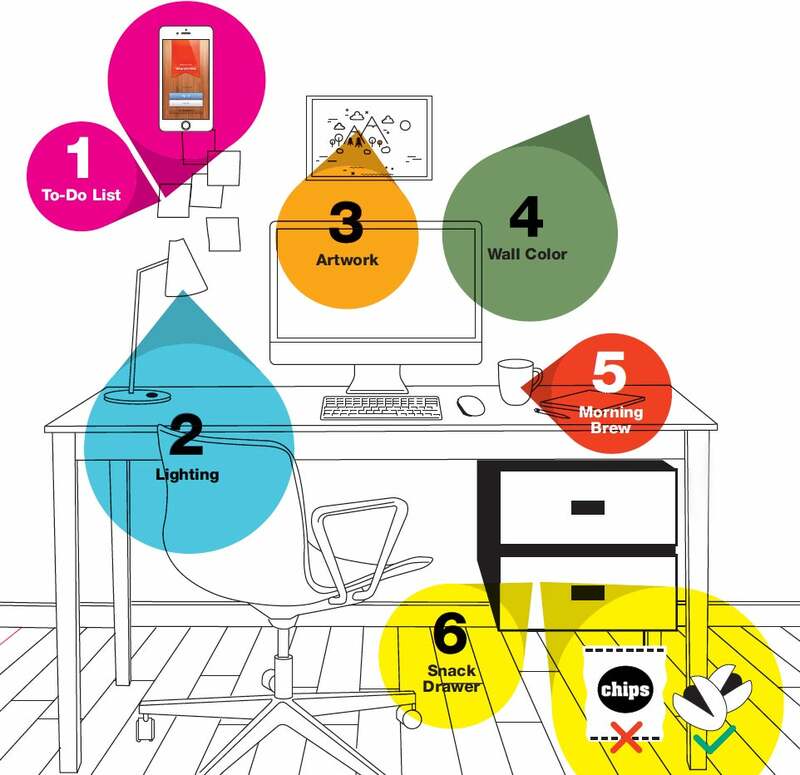 Start your New Year off right by setting up a workspace that will keep you motivated all day long. Check out these simple tips to boost productivity, health and happiness in your environment. 2. Pick a bulb that matches your work. Bluish lighting is good for analytical problem-solving, says environmental psychologist Sally Augustin, a principal at Design With Science. Warmer lighting is best suited for calming and soothing environments. 3. According to Augustin, office artwork should be “effortlessly fascinating.” “These are things that draw you in and give the part of your brain that has to focus a break,” she says. Try realistic nature art in a temperate climate, like a forest pathway. 4. “Paint walls a green that’s not very saturated but relatively bright, like a sage,” says Augustin. Research shows green encourages creative thinking, and light, bright hues are great for doing knowledge work. 5. Your morning buzz should perk you up, not weigh you down -- and sugary drinks can carry 500 calories. Registered dietitian LeeAnn Weintraub recommends chai tea instead. “You get that spicy flavor without having the high-fat coffee drink,” she says.